One of my goals is to teach the world to save money on groceries. Today I’m sharing some of my simple cheap dinner ideas I have used for years. By now you know I’m all about saving money on my grocery bill and yet eating healthy, nutritious meals. I’m going to break it out in sections to make it easy for you to pick and choose the ones you may want to try for dinner. I was just thinking about what a niece and nephew told me when they stayed with us. 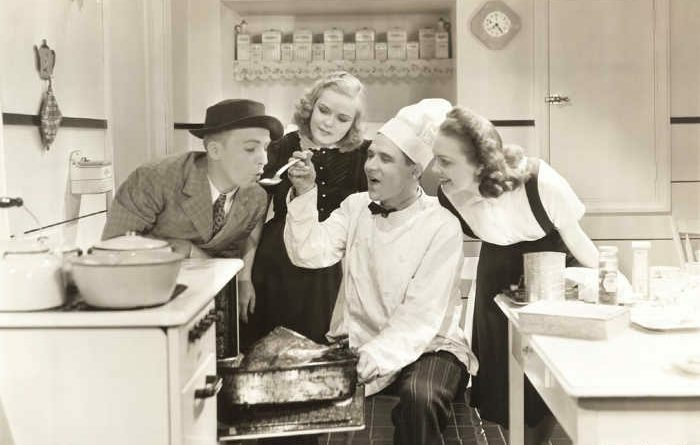 The mother felt like mothers were always rushed so she set a particular meal for breakfast for each day of the week. Sunday was waffles, Monday was cold cereal, Wednesday was breakfast burritos, Thursday was pancakes, Friday was hot cereal, and Saturday was scrambled eggs and toast. These may not be the exact meals she chose but she never wavered from her schedule of meals. It made the family time run smoothly. Why didn’t I think of this when my girls were younger? I always planned out dinners, but never breakfasts. Brilliant idea, thank you, Blair and Evonne. You will notice I have seven types of “nights” shown below. You can choose which meals are for Sunday, Monday, Tuesday, Wednesday, Thursday, Friday, and Saturday. All the simple cheap dinner ideas just need a dinner salad, green beans, corn, or other vegetables. Add some fresh fruit or canned fruit and you have a great dinner. Let’s get started. I like to cook a bag of chicken tenderloins (cheaper than breasts) in a slow cooker or pressure cooker. You can bake them boil, them or whatever. Then you shred the meat with two forks or you can use your KitchenAid Stand Mixer. Grab some freezer bags and measure the chicken into portions that work for you and your family. The tip here is to have a bag of 1-2 cups of chicken when you need it ASAP. As in for dinner tonight. You may have seen my Rotisserie Chicken Post, I love those $5.00 chickens from Costco. Chicken Haystacks (cooked rice, Chinese crunchy noodles, chicken and gravy, grated cheese, chopped celery, pineapple chunks, and shredded coconut. This sounds crazy, but it’s one of my favorite meals. I like to buy ground beef that is at least 93% meat (7% fat) Organic grass-fed beef tastes so much better. You can decide if you want cheaper meat, I’m just telling you how I stretch a dollar to get the good meat. I will add rice or cooked shredded potatoes to make the meat go farther. Or we will eat less meat and more vegetables. You may want to freeze your raw ground beef in one-pound packages. I love grabbing a frying pan and cooking some ground beef so it’s cooked and ready to serve with several meals. Let the meat cool and bag in packages that will fit with your recipes. Here again, I typically freeze 2 cups of ground beef in freezer bags. If you buy GOOD meat you can do this. Here again, saving me time and money. This could be roast beef, steak, cube steak, stew meat, or whatever. Let me tell you how I buy discounted beef such as these. I go to the store once or twice a month and go to the end of the meat section and look for the discounted meat. Now, you must go early in the morning or the meat may be gone. Which means I beat you to the deals, so to speak. When I hit the store I do not dilly dally around, I take a straight shot back with my cart to the meat aisle. This is when I go crazy, sort of. I start throwing everything that looks good to me in the cart. It has to be meat I want to prepare. I have purchased T-bone and Ribeye steak this way for $2.99 a package with two steaks in them. It’s like going to a Black Friday for me. You must also have room to freeze the meat. I like buying pork tenderloins because they have less waste, are tender, and there’s hardly any grizzle. I hate grizzle, I really do. Costco has a great deal where you get two or three chunks of pork tenderloin for about $10.00 or so. It would depend on the season, but it’s a good deal even when it costs $15.00. You then open the bags and cut the chunks into your preferred meal sizes. Some I cut into cubes, small roasts, and even pork chops. Yes, they are tender and juicy. I must confess, I do not care for fish, only shrimp cocktail, that’s it. Mark would love salmon, cod, halibut, and many more of those seafood specialties, but he would have to cook it when I’m not home. That’s how we roll. Someone brought us three Rainbow Trout, yep Mark cooked them when I was not at home. He ate them and loved every bite. I could easily be a vegetarian, Mark not so much. 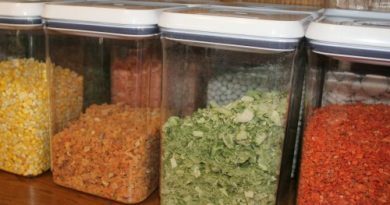 My food storage that’s in #10 cans is mainly freeze-dried fruits and vegetables. Yes, I have freeze-dried chicken and beef, and several types of freeze-dried cheeses. If you have potatoes, rice, and pasta just imagine what you can make with fresh, frozen, or canned vegetables. Oh, and having a garden, life is so good when you can grow your own veggies. Mix everything in the order shown except the egg whites and optional seeds. Knead for about five minutes in a bread mixer. Let rest for 15 minutes covered. 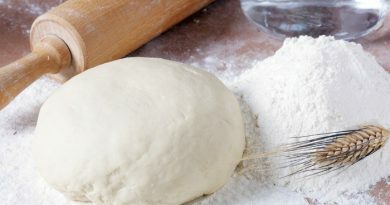 Shape the dough into 2 loaves and place on a greased cookie sheet. Lather the tops of the loaves with the egg whites, cut four to five shallow cuts on top of the loaves. Next, sprinkle seeds if desired. Let rise one more time about 15 minutes. Preheat the oven to 450 degrees and bake for 15 minutes. Let me know if you try some of my simple cheap dinner ideas, I love to hear from you. Thanks again for being prepared for the unexpected. We must keep prepping in order to be ready for whatever comes our way. May God bless this world. I finally tried the whole cook, shred, freeze idea this weekend. I only started with chicken but I have to say, just in the amount of space saved I am loving this. Next I will try it with chopped meat. thank for the tip on buying tenderloins instead! Your recipes are the best! They never fail to work. The French bread is one of my favorites. Thanks for all the wonderful ideas you share! 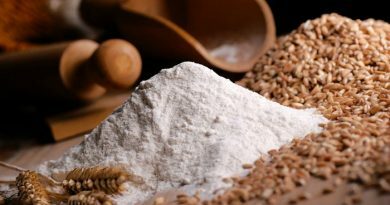 What is dough enhancer? 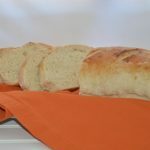 I have not baked bread or rolls in 4 years and would like to get back to baking them, I love the smell of fresh baked bread. I don’t have any counter space or any space to put a movable island in my kitchen. I hope to be moving in the next 3-4 months and am looking for a larger kitchen. 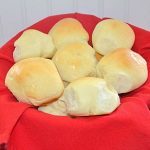 Thanks, love your articles, printed the french bread and dinner rolls recipes.